Each year, OSHA requires certain employers to complete the OSHA packet and have the 300A Summary form posted by February 1st. Filling out the OSHA 300 packet and also trying to determine what is, or is not considered a recordable injury can be confusing at times. For this reason, Lancaster Safety Consulting, Inc. (LSCI) hosts an annual Recordkeeping webinar which is available for free! Register for one of our webinars today by clicking here. 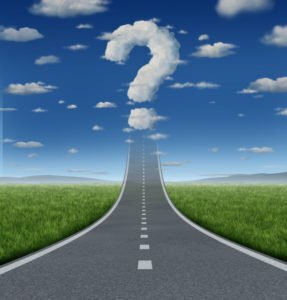 Q: Where can I find the OSHA Recordkeeping Packet? Q: When does the OSHA 300A form need to be posted? Q: Who is required to maintain injury and illness records? A: Employers with more than ten employees and whose establishments are not classified as a partially exempt industry must record work-related injuries and illnesses using OSHA Forms 300, 300A and 301. Employers who are required to keep Form 300, the Injury and Illness log, must post Form 300A, the Summary of Work-Related Injuries and Illness, in a workplace every year from February 1 to April 30. Current and former employees, or their representatives, have the right to access injury and illness records. 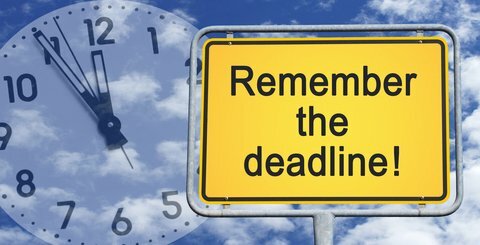 Employers must give the requester a copy of the relevant records by the end of the next business day. Q: Are any industries exempt from OSHA’s Recordkeeping Requirements? A: Yes. Partially exempt industries include establishments in specific low hazard retail, service, finance, insurance or real estate industries. OSHA has updated the list of industries that, due to relatively low occupational injury and illness rates, are exempt from the requirement to routinely keep injury and illness records. The new rule maintains the exemption for any employer with 10 or fewer employees, regardless of their industry classification, from the requirement to routinely keep records of worker injuries and illnesses. Q: What is recordable under OSHA’s recordkeeping requirements? A: OSHA’s definition of work-related injuries, illnesses, and fatalities are those in which an event or exposure in the work environment either caused or contributed to the condition. In addition, if an event or exposure in the work environment significantly aggravated a pre-existing injury or illness. OSHA has issued a final rule to improve tracking of workplace injuries & illnesses. This new rule requires certain employers to electronically submit their injury and illness information that they are already required to log on their OSHA recordkeeping forms. 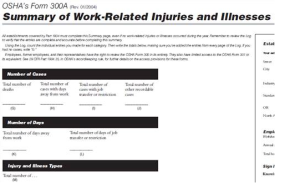 OSHA has created the Injury Tracking Application (ITA) for employers to provide their OSHA Form 300A information. Establishments with 250 or more employees that are currently required to keep OSHA injury and illness records, and establishments with 20-249 employees that are classified in certain industries with historically high rates of occupational injuries and illnesses. Covered establishments must electronically submit information from their OSHA Form 300A. 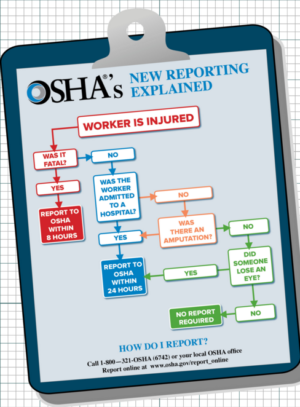 OSHA’s Announcements and Frequently Asked Questions regarding the Injury Tracking Application. Which Establishments with 20 to 249 employees must submit the OSHA 300A Form to OSHA Electronically? OSHA’s Injury Tracking Application Electronic Submission of Injury and Illness Records to OSHA! 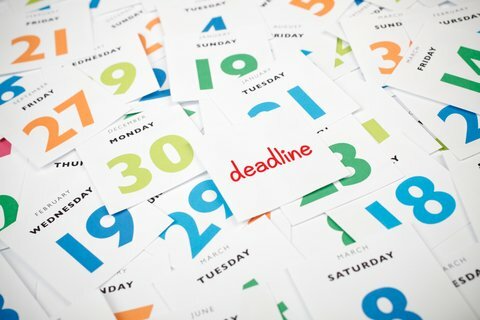 In 2019, the electronic submission deadline for the 2018 recordkeeping information is March 2, 2019. It is recommended to have LSCI review your OSHA 300A Summary before you submit it. You can also have LSCI submit your OSHA 300A Summary on behalf of your company! OSHA Recordkeeping Rule Change: As of January 1, 2015, we now have new regulations regarding injury and illness reporting requirements. The U.S. Department of Labor’s Occupational Safety and Health Administration announced a final rule requiring employers to notify OSHA when an employee is killed on the job or suffers a work-related hospitalization, amputation or loss of an eye. The rule, which has also updated the list of employers partially exempt from OSHA record-keeping requirements, went into effect on January 1, 2015 for all workplaces under federal OSHA jurisdiction. All employers covered by the Occupational Safety and Health Act, even those who are exempt from maintaining injury and illness records, are required to comply with OSHA’s new severe injury and illness reporting requirements. To assist employers in fulfilling these requirements, OSHA developed a web portal for employers to report incidents electronically, in addition to the phone reporting options. Looking for Assistance with Recordkeeping? Despite many available resources online, each business in America is likely to have their own unique situations that require assistance. Recordkeeping questions are the most popular topic we’re asked as Safety & Health Professionals. Feel free to visit our Safety & Health Blog to see what tricky questions we’ve answered for our clients and contact us for assistance today via phone at 888.403.6026. How Will the OSHA Reporting Requirements be more Successful? Until now, employers have only been required to notify OSHA within eight hours if three or more workers are hospitalized. Too many hazards are going undetected by this policy of only reporting the most serious of incidents. OSHA will now be able to take action as soon as one employee is seriously hurt; hopefully preventing fatalities from even happening. The employer will be required to provide an explanation regarding how the contributing hazard(s) will be mitigated and future injuries prevented. OSHA may or may not send a compliance officer out to conduct an inspection after each reported injury. However; the employer must answer questions regarding the details of the incident. These new reports of severe injuries and illnesses will all be public, on the OSHA website. Need help? Give us a call at 888.403.6026 or contact us here. Follow us on Facebook, Twitter, and LinkedIn for more safety resources and sign up for our webinar alerts so you don’t miss our annual recordkeeping webinar!